So, my writing was selected and (2-1 acts) performed at a fundraiser spaghetti dinner Mother's Day weekend by the Keuka Lake Players. Wow! I am still in shock over this. That my writing is good enough to be selected is still blowing my mind. 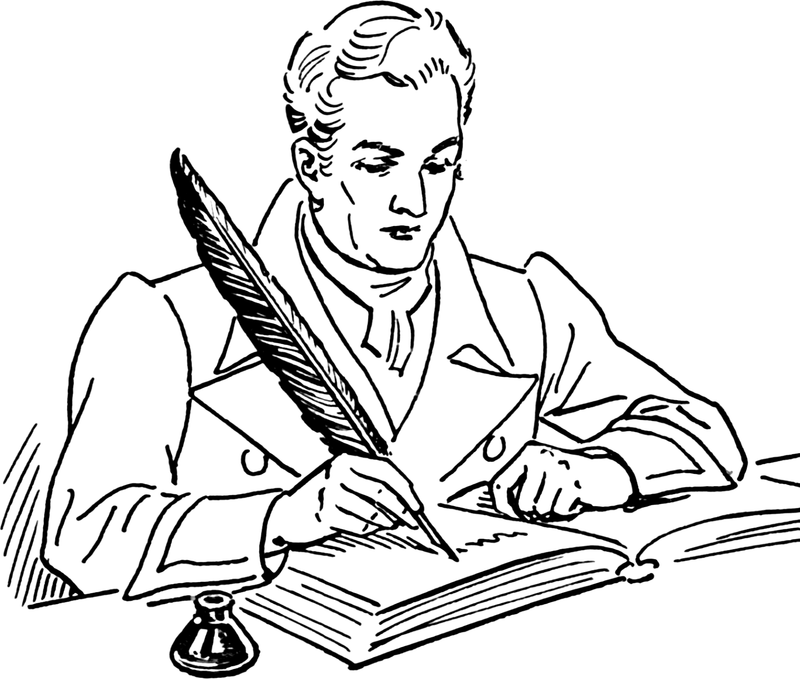 I haven't always wanted to be a writer; at first it was a veterinarian, then a librarian, now it's definitely a writer. I definitely loved books, I wouldn't pass up the opportunity to be a librarian, but there is something about writing that gets me going. 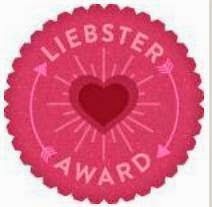 My good friend Leah told me last night, after the dinner where I was presented this this beautiful certificate you see above, "God loves the Creative process." Those word really stuck with me. The Creator, God, Goddess, Yahweh, Jehovah, Allah, Mother, Father (you name a name and I will include it. You get the picture) seems to really thrive within the creative. I can see a number of creative folks who are spiritual in some sense of the word (it's not an exclusive thing either), as spiritual can be how you feel about science, nature, god, the universe, or the Doctor :-). This is a religious/faith based blog, per se, but it resonated that the Powers of the Universe really enjoy this creative process. Writing is much like giving birth to a child, there is pain, but also this profound sense of completion (not having kids I can only imagine, but I have plenty of friends who have told me something akin to this). It's not just writing either, when I directed "Charlotte's Web" or assisted Directed "Sweeney Todd" I felt a closeness to something greater. I put my whole into those projects, so that other people could enjoy these things too. Because of that, I would like to think I have made the world a better place by making (birthing) something beautiful. It's probably why I am an actor too. When I am onstage, my world becomes that part I am playing. These are the things that truly make me happy, but writing has become the thing MOST close to my heart. If you were to ask me, I would say that I am a poet first, but after this past year, writing plays has certainly moved up on my list. I have also wrote a novel (still in the editing process) and a screenplay (also in process). I am not limiting myself, I am writing anything and everything I can. I want to be a writer! I am a writer. Something that is also important, and has proven to help me grow as a writer is that bolstering of talent amongst my fellows, both young and older. There is nothing more satisfying than seeing others create and thrive because I helped give them a chance, that I believed in them (and continue to do so), and that I will not let them fall (not my words originally, but that are so profound). This was the case during the Lake Country Players 1st 24 Hour Theatre. I saw new writers, directors, and actors making amazingly beautiful things for the world to enjoy. I also saw amazingly awesome things during Charlotte's Web, which I also feel that way about. The talent that was in that show blew me away, and I got to help feed the talent and confidences in all of those actors and crew members. It really does do my heart good. 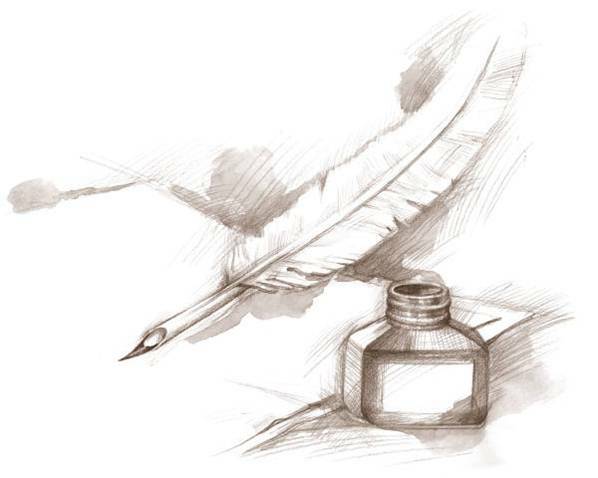 Sonnets are a lovely forms of poetry and a lyrical jungle gym, but when you know what a sonnet is and how it's made up then it's easier to take a crack at writing them. For me sonnets are like little stories. In many ways that's how Shakespeare presents his sonnets. Let's take one of mine and dissect it. Now that we have the structure, let's discuss the Iambic Pentameter! OOOOO, big word thingie!!! Iambic Pentameter is not as scary as you would think. Yes, it takes a bit of practice. To break it down, each line of the sonnet, both quatrain and couplet, is made up of Iambic Feet (a foot is a stressed and unstressed syllable). Each line has 5 Iambic Feet, roughly 10 syllables, "Built like children’s blocks to form a support." Note how the each colour has 2 syllables, making each colour a foot. After many tries I think I have balanced the unstressed and stressed syllables, but I also am still learning and am not quite the expert, yet. If you have tips, please share them in the comments box, on how to build proper Iambic Feet. I find that after a number of tries you notice the rhyme of the sonnet. It could almost be sung. This is a sign you have the idea, or the rhythm. With that, the next step is to write. You can't very well learn to writ sonnets without actually writing. I would recommend just picking a topic and writing. Don't worry about rhyming or iambic pentameter, just write a basic poem in the outline of the sonnet (using the 3 quatrain and a couplet.). After to get your rough draft sonnet then go back and figure out the rhyme and the iambic pentameter. I like to use THE THESAURUS (online version) and THE RHYMER (online version) to help with finding the right words and rhymes, you can use real books too. I also, spent a lot of time clapping out the rhythm of the lines. Use whatever means when help you to get the Iambic Pentameter right. 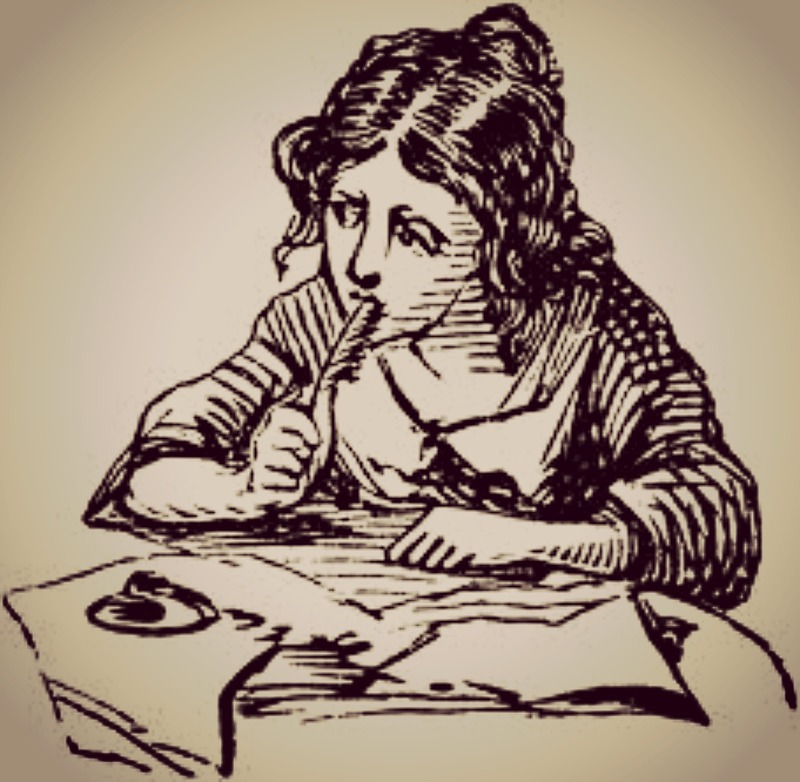 If jumping right in to write whole sonnets is a bit daunting, then start by writing couplets, using rhyme and iambic pentameter. Start simple and build up! You have the potential! I believe in you! So, go out there and write some sonnets! Let's bring back the art of poetry back into the mainstream! ~w00t~ Okay, well, I hope I inspired you to write. Feel free to post your own sonnets in the comment box. I would LOVE to see what you guys come up with. Top 5 "Why Do They Repeatedily Play These Songs on the Radio"
So, because I listen to the radio at work, I tend to hear songs on repeat, ad naseum. Good news is that I listen to a classic oldies station, so I hear a number of songs that I enjoy, such as The Beatles, Elton John, Billy Joel. On the flip side I hear music for up to eight hours a day from the same station. This repetition gets annoying after a while; this weeks blog is about songs that you would rather have a lobotomy than hear them for the umpteenth time. I am using COOL96, 96.1 out of Waverly/Elmira. I must point out that I enjoy the station as a whole and just felt compelled to make a Top 5 list of REALLY ANNOYING SONGS ON THE RADIO blog. I am pretty sure this list would go for any classic/oldies station in any part of the country. 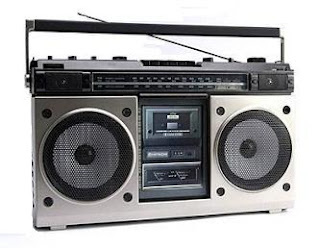 I would love to hear what other songs are really over played, on classic/oldies station, but not excluding input from contemporary stations either.Please leave a comment below with what you would add. After read the back story, I feel bad including this song on the list now. But, I hear it almost daily, that is the real reason why I have included. I am an avid Elton fan. The reason I included it was simply because I do hear it so often. Too much of anything and it’s becomes annoying/irritating and I start to like it. This is the reason why “Some Saved…” made the list. I respect Elton and Bernie, after all they became quite the songwriting/musician duo of EVERYTHING. Okay, that might be saying a lot, but when you look at the music, those two have a great chemistry. I do like sad songs by Elton, but “Someone Saved…” doesn’t make the big list. I will say list, to sing about something so personal is the biggest risk, but also can be some of the biggest healing that can happen to a person. Personally, not a bad song, Elton’s voice is always a pleasure to hear, but on daily repeat it loses something. 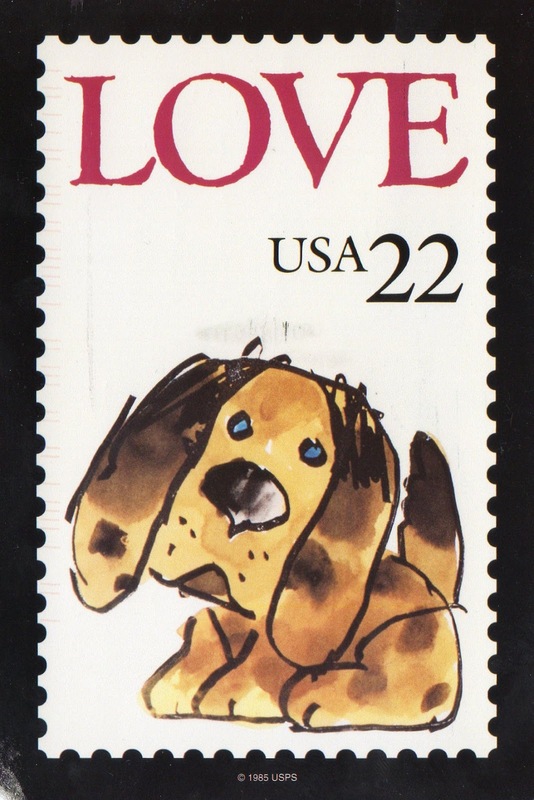 There are a billion and one songs that use the term “Everlasting Love” in the title or in the song’s body. This version has to be the MOST annoying ever! The sugary lyrics, the brassy brass, it really gets under my skin. I grew up listening to much of the catalogue of the 50’s and 60’s and this song I would regulate to the back of the record bin. It a standard theme of the era, but that means it blends in with most of the other music in that year. The funny thing is that “Everlasting Love” was recorded by 2 other artists prior to Mr. Carlton recording it in the early 70’s. Robert Knight’s version peaked on Billboard’s charts at #13 in 1967; #40 in 1968 and#19 in 1974 in the UK. Then Love Affair recorded it and reached #1 on the UK singles chart in 1968. Carl Carlton recorded the most successful version of this song where it reached #6 in 1974 on Billboard’s charts. There numerous other version recordings of this song including the 1981 Rex Smith/Rachel Sweet version, 1987 Sandra version (German born singer), and Gloria Estefan in 1994. Oh Gloria, WHY?!?! There are about 43 other versions by artist from around the world since the sixties that have recorded this song. If you are curious Wikipedia has a nice list and I bet you can find all of them on youtube, spotify, itunes, or amazon, etc. It’s certainly a prolific song, or at least an everlasting song. Ha! See what I did there…. :-) Note: This song is not Howard Jones “Everlasting Love” Which is probably just as cheesy, but I feel has a better feel to the sentiment, even if it uses the mega synth-tastic of the 1980’s. The video is totally worth watching. Still after listening to all version, none of them can make me like the song, it is just not a good song. Okay, not a Barry White fan at all. Sorry! Just putting it out there! I would rather not listen to him speak singing/shrieking his lyrics. This song covers both those style. It comes off and sloppy. You either sing, or talk, but don’t try to do both. I usually grit my teeth when this comes on. Number 2: The 5th Dimension “Wedding Bell Blues"
So, whiny song about wanting to get married, even before Katy Perry hit the scene, we have the 5th Dimension song about one of the whiniest ladies out there. The song was written and recorded by Laura Nyro in 1966. While not the huge hit-the 5th Dimension made it the chart topper-some claim that it’s the superior version. I am not familiar with Nyro’s work, her version hit #103 on Billboard’s “Pop Singles ‘Bubbling Under’ charts segment” for a number of weeks. It many ways her version is less annoying and vocal wise she has some great chops. Unfortunately, what gets played is the version with over the top, Marilyn McCoo singing. I am not fond of the subject matter, but Laura Nyro can at least pull it off with her simple vocals. I still find any version rather bothersome with the lead singer pining for their boyfriend to propose to them. It’s just not stellar lyrics, people, I’m sorry. I just can’t like the song. I have heard enough crap time to listen to something that doesn’t make my ears bleed. Maybe I should just hook my mp3 player to my radio J That might solve my problem. Anytime you listen to the radio, yo0u will get overlapping and repetition. ~SIGH~ Oh, well…hope you enjoy my random rant this week. It was kind of fun to dig into the archive and discover other artists, even if I will never respect Gloria Estefan again. So, in the past 2 weeks I have finished my month long sonnet-a-day project and hosted 24 Hour Theatre. I am quite pooped, but very satisfied with how it all went down. I am not one to sit idly by for long. This is a story of a number of things that brought me to this point, so important lessons that have change my outlook. See, 2012 was a VERY busy year for me, actually it started sooner, the 2012 was truly a busy year. Back in august of 2011 I was laid-off I was suddenly not busy without having a job to go to. I threw myself into theatre. It's one of my hobbies, and a solstice to the long boring days of unemployment. I was asked to assistant direct a production of "Sweeney Todd" quite the endevour. I enjoyed the thrill and challenge and learned a great many things about the theatre arts. After Sweeney, there was the Christmas shows and auditions for "A Midsummer's Night Dream"; I got cast as Bottom. That was the first 5 month of 2012. I also became employed again, and I still was doing all manners of theatre, Oliver! in the Summer and then directing Charlotte's Web in the Fall. The whole time I was swept into a world of imagination and music. By the time I hit Thanksgiving I was ready for a break. At that time I had also decided that I was going to devote more time to writing. 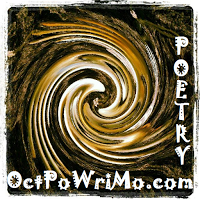 I wrote a novel through "National Novel Writing Month" (NaNoWriMo) in November 2011, and started writing stories, poetry, anything. By Fall 2012, I was so busy with Charlotte's Web that NaNo was not an option, but I still wanted to write. I start "Here, There by a Writer" in November 2012 as a blog. It was partially because the post show crash with Charlotte was harder than any other show I had done previous. I had given 'birth' to a theatre baby and that kind of emotional rush is hard to let go of. So, I blogged about it. That lead to a previous idea that I had had, about trying to go free lance with my writing. I had proven that I could write and write to some degree of skill. "Here, There be a Writer" was the perfect outlet. So, I brainstormed ideas and concepts of things I wanted to research and write about. Sometimes it was an interview with someone, other times it was a retrospective on something from my childhood, or even a top 10 list of something that inspired me. 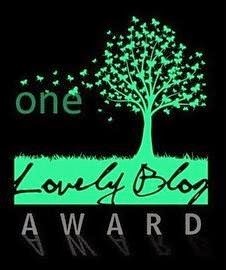 The blog almost 4 month old, and I do not feel that it's slowing down. I blogged about sonnets one day, after I decide that I wanted to try writing in Iambic Pentameter. That was the beginning of the month long project and to make it a challenge I chose to still blog one a week and write a sonnet-a-day. Even more of a challenge was when I ask friends for sonnet topics. This lent itself to some interesting topics and some creative telling, or retelling of stories, ranging from Vertebrae to cheese and numerous Doctor Who related topics. I did it! I wrote 31 sonnets (from February 11 to March 14th) which was when I wrote my last sonnet (well, not last, but the last for this project). It was a fun and awesome ride. I learned a few things about writing and myself in that month. Iambic Pentameter is not as hard as you think to write it. 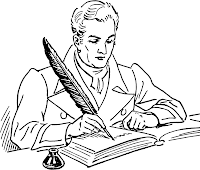 After a while you well often write the right number of iambic feet in a sentence (line). Rhyme is hard, but not difficult. I still haven't mastered writing rhyme on the first draft of a sonnet. There are get tools that make writing sonnets easy. Rhymer.com is a rhyming site, very handy for getting the right word to match the rhyme. Thesaurus's are your friend. Whether it's an online one, or a real book version, a thesaurus is very useful. I think it also helps increase one's vocabulary. I feel more confident with my writing after this month of literary happenstance. There are other poem styles that I want to revisit, forms that I wrote back in college, but haven't touch since then (Villianelles, Terzenelles, Sestinas). I also feel that I get inspired more after writing these sonnets. I am not by your side. What do you do? wise, know that words can cause us two, to part. To me, within a poem of your own speak. And to the post you go without a creak. the letter to one that makes your heart race. Something else that has brought a change in how I view myself and the world is a book and the author of this book. My really dear friend who lives in another state, had told me about this inspirational book by this writer friend of hers. He was giving away digital copies of this book. She recommended I that read it. she said it would change my life. It was a short read. You should give it a try. ...and I cried! I found it very open. Almost as if this man was baring his soul to me. It reminded me of all the times I would go to Perkins with my best friend and we would talk, baring our souls to each other. This man was telling me about his life, the hardships, the joys, the lessons, and the the realizations. I saw myself in some of these moments. I saw that even after everything he still kept going. He found a way past those 'speed bumps' of life and made his dreams into reality. I was left with a sense of wonder, that if this man, this random man on the other side of the country can pull himself up out of the mistakes he made and find joy in the everyday, then certainly I could too. 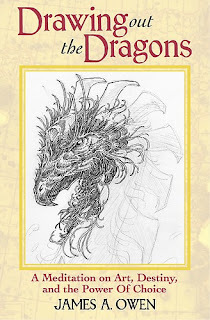 That was my introduction to James Owen and "Drawing Out the Dragons." I have never been the same after. Not long after I read "Drawing Out the Dragons" there came "The Barbizon Dairies" book two in a trilogy series call "The Meditations". 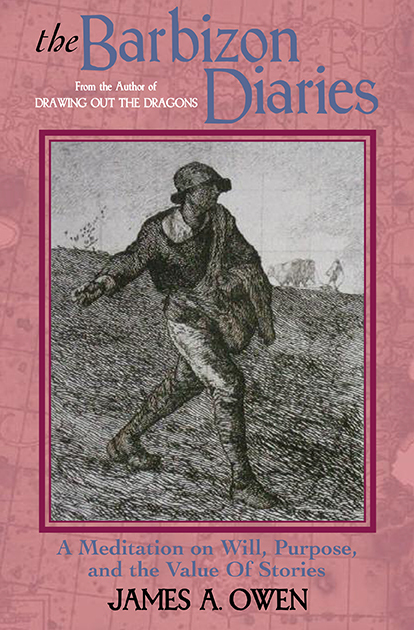 I bought the digital version of Dairies and read it from my computer in a few hours (not owning a Kindle or Nook). I balled! I sat there and cried! Afterward I came to realize something, something that James was trying so hard to teach others. No matter what, you, YOU have a choice in how you live, you feel, and make your own way through this life. It's so much more than that, but sometimes word fail me when trying to explain something that is so very important and very emotional for me. I even told James in a poem (actually to poems, one a free verse and one a sonnet) what my heart felt after reading his meditations. I cannot accept feeling sorry for myself, when there's a life to live, books to read, movie to watch, and choices to make. I used many of James' phiolosophies in my directing of my Charlotte cast, to help them bring out their own great, their own personal brand of awesome. This is the quote that went with each of my emails to my cast! James tells people that all it really takes is one person to tell you that they believe in you, and that start a chain reaction of goodness and awesome that awakens the soul. "I Believe in You!" It's a small sentence, but it packs a punch. I DO NOT say this unless I mean it! I had my Wilbur, in her first show, with some intense stage nerves. I kid you not, I told her that I believed in her, and the young lady wowed 3 nights of audience members that weekend. I just headed up an event called 24 Hour Theatre that my friend Sara Love introduced me too 2 years ago with one of the theatre groups I perform with (there are about 4 or 5 theatre organizations in the area where I live). I decide to bring this concept to my home theatre group. You create theatre in 1 day! Writers write shows the night before, then the next day directors and actors bring the shows to life. I found 6 teams of writers to write 6 shows and 6 directors to direct these shows, and about 20 actors to act in these show. Again I have taken James philosophies to boater the creative energies of these people and make something truly amazing, beautiful, and awesome. not always apparent, or immediate." no one can help you." I saw people working together to make stories come to life. I saw blossoming writers and directors who were coming alive by the chance I gave them. I saw new friendships begin. I saw people from different theatre groups working together. It has made me so happy to known that I have helped create this beautiful moment. It has given me purpose to a previously failing attitude that I had been holding onto. Not only has James bolstered my writing confidence, but he has helped me to see that I can help others. I would recommend "Drawing out the Dragons" and "The Barbizon Dairies" to anyone looking for a little help. maybe a hand to hold crossing the bridge, riding the bike, or just a dark in the dark. I cannot wait for the final book in the Meditation Trilogy, "The Grand Design". My heart is lighter and I enjoy waking up more (well, as long as I have my coffee too). Thank you James!! ...For Here, There be a Writer! You know something? It wasn’t long ago that I a regular person. 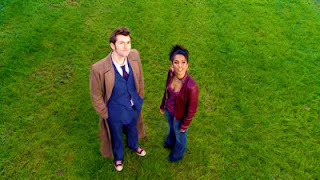 I didn't become a Whovian, in any sense of the word until that faithful day I decided to watch the episode "Rose". Before that, I knew what Doctor Who was, or who he was. But did I paid attention to the newest incarnation? No, not really. I had two friends in particular who loved to geek out to Who during any of our theatre get togethers, specifically our annual summer picnics at Jane's. Usually just smile and nod while they talked about the Tardis, Daleks, and the Doctor. It was after Jane moved to Wisconsin, that I began my trek into the Who-Verse. I don’t think that having a close friend move away would cause me to suddenly get into a show, that was just odd timing. I think I was looking for an excuse to start watching, and now Amanda was in need a fellow local Whovian to geek out with (so it only made sense that it be me). I was also sick of being lost whenever hearing about anything Doctor Who, David Tennant, or Matt Smith. I had/have so many Whovian friends that i could help but feel lost. Since getting the streaming Netflix through the PS3 and with all (well MOST) of the current Doctor Who up there (and in one place) it made it easier to get sucked into. But I think the REAL reason is that after having listened to both Jane and Amanda talk about it for so long I just got curious. 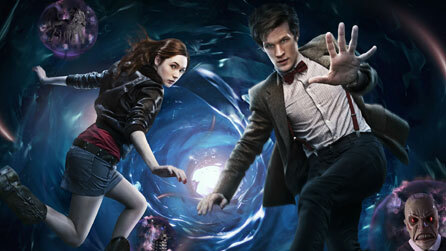 So, I cite those two as my biggest influences of things Doctor Who. 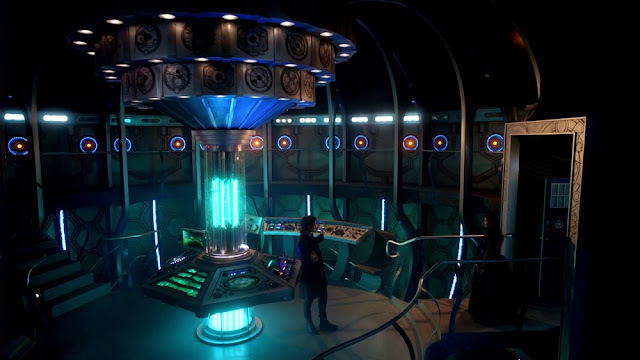 What I found there-in the Tardis and the time/space vortex-was a magical and well thought out show with nary an unwatchable episode; barring “Love and Monsters” (we will not discuss that one at this time). 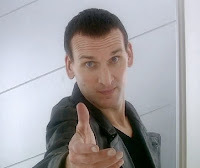 I was introduced to Christopher Eccleston. 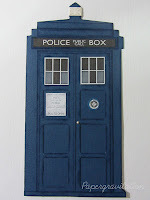 I, Cynthia Scott, I am a Whovian! Christopher Eccleston was my first. He is the Doctor I wanted to dance with and go to the end of the universe with. Something about those big arsed ears, bright blue eyes, and that goofy grin. He was FAN-TASTIC!!! At the end of his season I was sad to see him go. I told myself and other Whovian friends that I wasn’t going to like Tennant. No way! He wasn’t Eccleston. How could anyone be as awesome as Eccleston in “The End of the Universe”, “The Empty Child/The Doctor Dances” (my favourite episodes), or “Bad Wolf/Parting of Ways”? If you say run, I will follow you, Doctor! Well, then I started the Tennant years and DAMN! 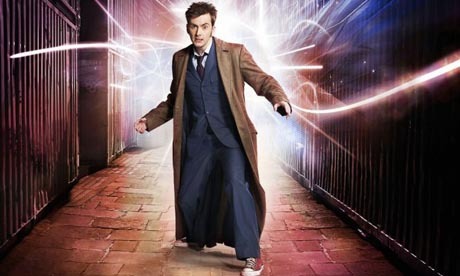 The first episode I was a bit disappointed, because Tennant spent most of the episode out cold from regenerating. When I got further into Series 2, Tennant became the thing that made me all warm and smooshy inside. He also lasted 3 plus years, which meant a lot of adventures were to be had with him. In that time Rose stayed and then was lost (of we knew where she was, but couldn’t get there), then Martha who came and left on her own, and then Donna Noble (who I sill think was cheated of her ending, wonderfully happy though it was). All were good companions, but one stuck out. Donna Noble! She was equal to the Doctor and also not a love sick puppy. I liked how Rose and the Doctor were the closest thing to a real relationship until River Song came on the scene ~not really a SPOILER~. It was sweet! It was hard to see Martha placed in that role and her clinging to the hope of the Doctor’s love. It got old after a while. Donna was unique in that she didn’t want to have a physical relationship with the Doctor. I feel like that gave the writer’s more room to expand her character and the adventure they had. 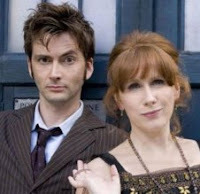 Of all of Tennant’s seasons, Donna Noble’s year was/is my favourite. Favourite episodes include are a plenty here, so I will narrow it down; “Fires of Pompeii”, “Planet of the Ood”, “The Unicorn and the Wasp”, “Silence in the Library/Forest of the Dead”, and “Turn Left”. I also like “Midnight”, since both Turn Left and Midnight are episodes where the other in only briefly mentioned, it’s a fun side story for each. That’s not whittling it down, is it? Going back to Rose and Tennant, my favourite episodes are; “School Reunion”, “The Girl in the Fireplace”, and “The Impossible Planet/Satan Pit”. The writing was the best in the Impossible Planet, but these stories are the ones that make me smile when I watch them. Did you even know that Billie Piper was a pop star before she became Rose Tyler. If you old news I am sure, but when I looked up some of her songs, I rather enjoyed them. Not the most intellectual, but Walk of Life is a pleasant little song. Now with Martha I would have to go with, “The Shakespearean Code”, “Daleks in Manhattan/Evolution of the Daleks”, and “Blink”. Blink is the best writing and has less doctor, but soooooo good. The Shakespeare Code was just fun, and after having done a production of Midsummer’s Night Dream, I couldn’t help but enjoy this episode. Also, they refer to the town of ‘Freedonia’, which is ironic as I am from Fredonia, NY. HA! I haven’t forgotten Matt Smith. I am amused to look back and see how I was not really ready for him, in much the same way as Tennant, but ready to like him (as many friend were anti-Smith at the time). I told myself that I was going to have to deal with it and plowed through. I was so very pleased. To my surprise, I fell in love with him after “The Beast Below” with the Space Whale. 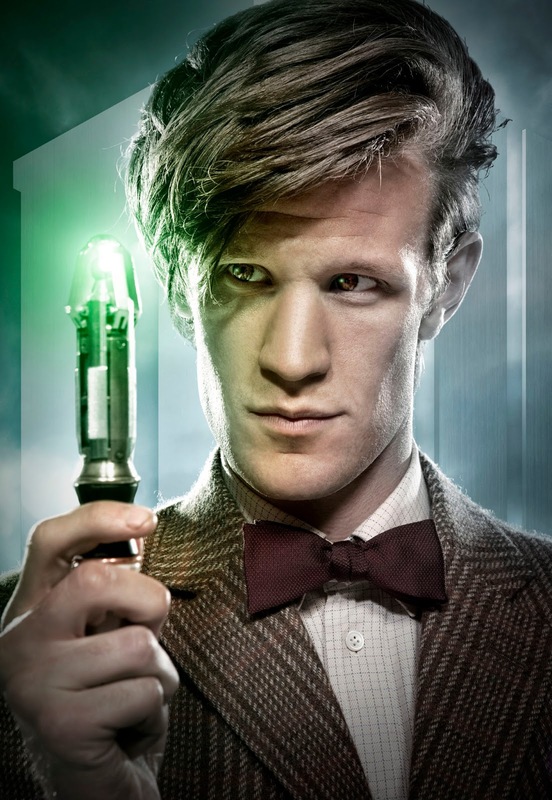 It made me melt, and I realized that Matt Smith was gonna be great Doctor! 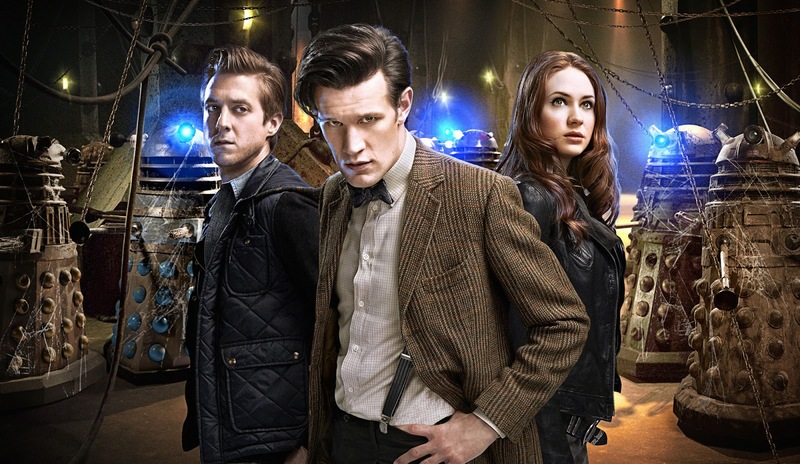 The Angels return in “The Time of Angels/Flesh and Bone” and the Doctor and Amy visiting Van Gogh “The Doctor and Van Gogh” were probably some of the best episodes, writing wise and character development wise, and are my favourite episodes on Series 5. The season culminated/ended (?) with the Christmas episode, “A Christmas Carol” which is now my favourite version of Christmas Carol, outside of “The Muppet Christmas Carol”. That’s a tough choice! I have already battled against supreme Whovian Sara Love over it. It was left a tie! Seeing as Series 5 is its own story; the crack in the universe, one kind of needs to look at it as a whole. The writing was stellar, but nothing compared to Series 6. Damn! As much as almost continuous plots can irk me, because if you miss an episode then you are lost, the crack plot (ha! A pun…) kept me intrigued while still having fun with other stories that were going on at he same time. Not Series 6 (I just like the picture). Series 6 is more like a book with chapters and that you cannot put in down. Your reading and reading cause you want to know what happens next. All of the stories blend into each other and then into the bigger story of the Doctor. ~NO SPOILERS HERE~ So, I have a harder time pin-pointing episodes that are my favourite. In Series 6 I guess I would choose “The Doctor’s Wife” written by Neil Gaiman (that man is awesome in his own rite), “Let’s Kill Hitler!” (It’s not amazing writing, but it’s a fun episode, and “Closing Time” with the return of Alfie AKA “Stormadgeddon” and his Dad. In all, the whole season is noteworthy, with a well thought out plot and characters that are well developed. Now Series 7 has changed it up with no long running story arcs in this first half. It felt good to have just simple (as simple as anything with the Doctor goes) stories to enjoy. 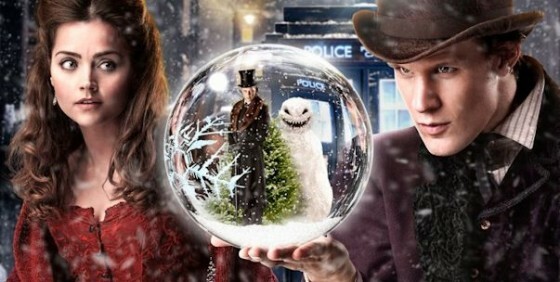 Currently my favourite Series 7 episodes are “Asylum of the Daleks”, “A Town Called Mercy”, and “The Snowmen.” Clara is going to be a fun companion. Now to wait for be more Doctor…. in an eternal chase a constant race. leading the charge to the fragile earth's fight. the steps of the space waltz, held in a trance. nor least of space, your songs they always rhyme. When only recently you have grown near. Held solid by a tough disposition. Those crushing memories give you action. A penance is what yours is fully worth. Today is Dr. Seuss birthday (3/2)! Even though he passed back in 1991, her is just as popular today, probably more so. I grew up reading his books whether from my own collection or what the Barker Library had. I loved the characters and places that Theodore Geisel created, so to pay him a bit of tribute, I present my top 5 Dr.Seuss books. It's kind of hard to narrow down the choices to 5, after all, I think many of us grew up on the likes "The Cat in the Hat", "Green Eggs and Ham", or "Horton Hears a Who!". I am not sure if this is an easy list to make. I am choosing my favourite picks (which included some of the lesser known books), so, maybe some of you would be less familiar with the selections I chose. Give them a look see if you are inclined to. I know I would be. There have been a few movie made recently about some of Seuss's stories that are featured more in the mainstream, and while those stories are awesome in their own write, now is not the time. 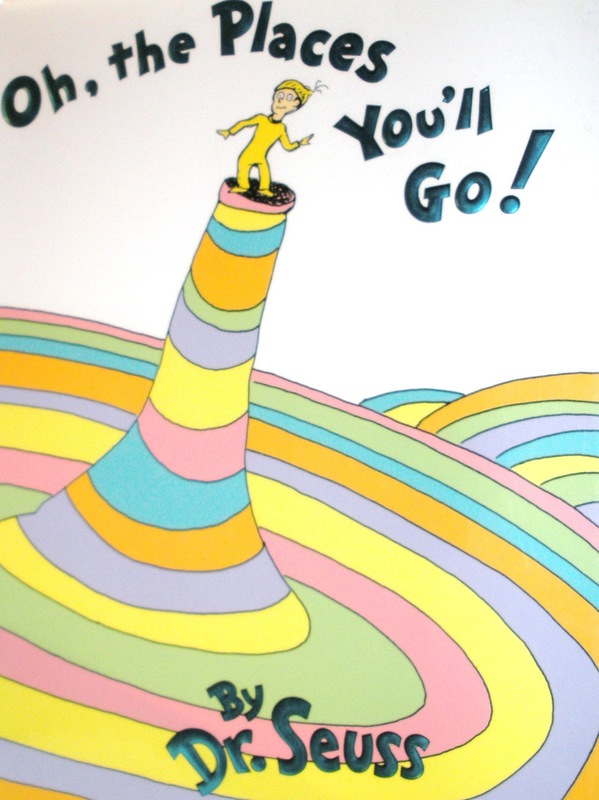 I do have a nice little collection of Dr. Seuss books from my childhood. These are the ones that I have read repeatedly, along with those that were at my local library, (Darwin R. Barker Library in Fredonia). Also, I need to point out that I have seen most, if not all of the TV specials and all of the major motion pictures, some of which are very good and others not so good. That is neither here nor there, in a box or with a fox (perhaps a future blog?). This list is from the books I read as a child, with one exception (which I will explain later). What a silly load of nonsense! 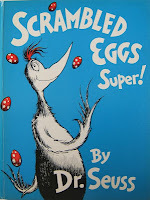 But, seriously, I know I wished I could eat green eggs and ham, especially with a Fox in a Box (not Megan Fox folks). I don't try to read anything into this, much as people have done of late. It is pure nonsense, plain and simple. The rhyme and the rhythm are the best part of the book. It's all just a good time, with a bit of a lesson tacked on. Nothing is wrong with trying to get your kids to eat their veggies with a bit of storytelling. Years later the band Moxy Fruvous wrote a song that goes with the story of Green Eggs and Ham. I think it only makes the story that much more AWESOME! 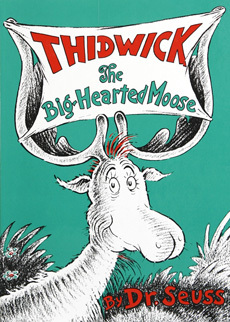 A story about a moose that let's other animals live on his antlers because they need a place to live. He might be kind, or maybe a sap, but Thidwick always helps his friends. While the moral consequence of the story could be that you shouldn't let your friend's use you, the ending speaks for itself. I won't ruin the surprise, but I ask that if you are curious go check it out. No spoilers this time! It's a cute story. This is one of many books that I would borrow repeated from the library. Number #3: Scrambled Eggs Super! A tale of the search for the greatest scrambled egg dish! Take a look at a neat video telling of this story: Scrambled Eggs Super! 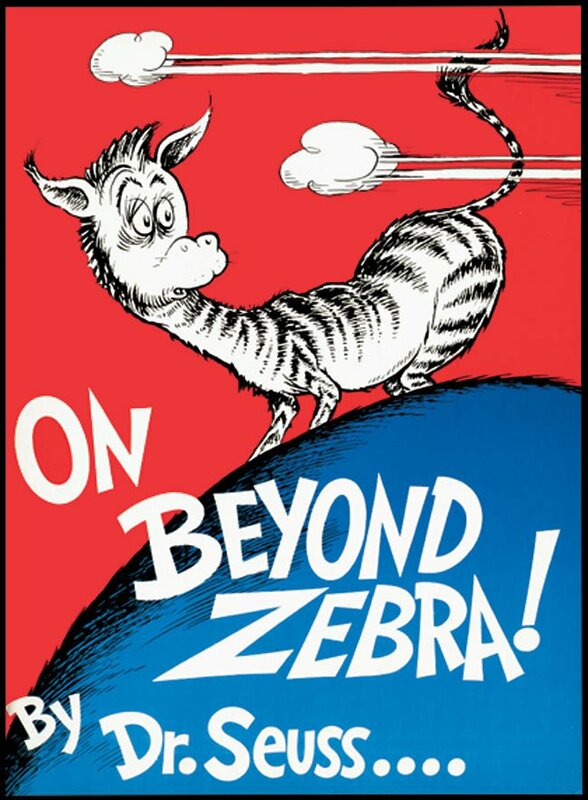 Number #2: On Beyond Zebra! 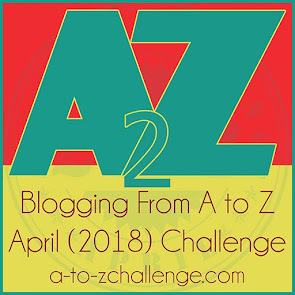 On Beyond Zebra is a looks at the alphabet after it ends with Z for Zebra! This book is even more nonsense than Green Eggs and Ham, but the allure of it was really the fabulous creatures that Dr. Seuss came up with for each of the new letters. 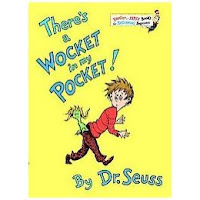 Number #1: There's a Wocket in My Pocket! Now, this one I definitely read a lot. I had my own copy, and when I would read this story I would often imagine or create scenarios about the different creatures that lived in this kid's house. MY favourite page was always the creatures that lived in the kid's cellar. If there were those kinds of things in my cellar; I would be okay with that. See, it's like a party down there! I even labeled which creature was which, at least in my own head. 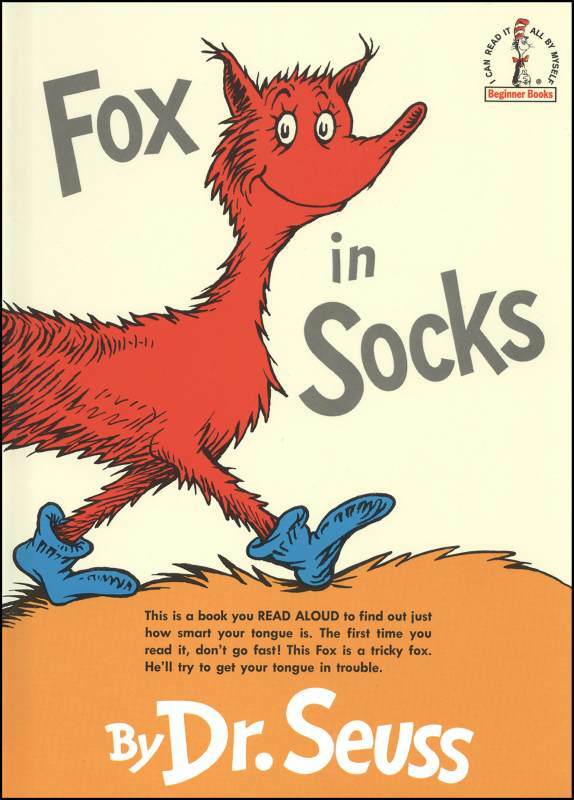 And the honourable mentions: Fox in Socks, Oh, The Places You'll Go!, and Oh, the Thinks you can Think. I got the Oh, the Places You'll Go! as a graduation present from a former tutor. 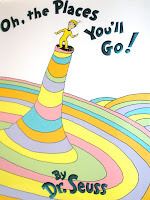 In many ways Dr. Seuss was a great lifter of spirits and a personal pep squad cheering you on. And, "A Little Nonsense now and then is relished by the wisest men!" ~ Gene Wilder as Willy Wonka. I think that sums up Dr. Seuss a little nonsense and a lot of imagination. Hope you enjoyed my list. 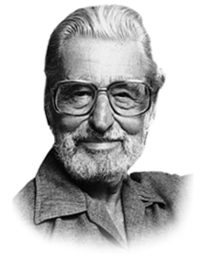 Happy Birthday Dr. Seuss, wherever you are! !